Harish Devarajan founded Deep Value, and serves as its Chief Executive Officer. 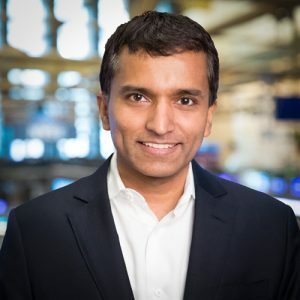 Prior to Deep Value, Harish Devarajan worked at a proprietary trading desk at Deutsche Bank as its Chief Operating Officer. As COO Harish was responsible for the group’s technology effort; execution management (lead negotiator with various liquidity destinations to route over a quarter-trillion dollars’ worth of Deutsche Bank N.A. order flow annually); and developing profitable trading strategies. Harish is a founding investor and serves on the Board of OpenTap, a fintech startup that is bringing high quality credit products to a large market of low-risk, underserved consumers in India. Harish holds advanced degrees in computer science and mathematics from Stanford University and the Massachusetts Institute of Technology.